This is a list of pre-release and unused content for the game Luigi's Mansion. Different kinds of houses were proposed for the game, including an apartment complex, a dollhouse, a "ninja mansion", a Japanese-style house, a prairie, and a desert level using a Mario theme. The game was originally conceptualized to resemble the Mario series more closely, but strayed when the haunted western mansion concept took priority. The idea of multiple, Mario-esque themed houses would later be used in the game's sequel. Luigi's Mansion was developed with stereoscopic 3D compatibility. The Nintendo GameCube was built with 3D components which could be activated by an unreleased add-on. This add-on was never released as its price would have been far greater than the console. Another unreleased add-on would have allowed the Game Boy Advance to be used as an external controller in conjunction with the game. The game's remake and sequel both support stereoscopic 3D, as they were released for the Nintendo 3DS. Concepts for Luigi's Mansion, such as character designs, were being planned during the Nintendo 64's lifetime. The game was first revealed at Nintendo Space World in 2000 as a Tech demo, designed to show off the graphical capabilities of the Nintendo GameCube. Nintendo then decided to make Luigi's Mansion into a full-fledged game, and was later showcased at E3 in 2001, with notable changes to the design of the disc. Old issues of Nintendo Power (pictured below) contain details of early elements in screenshots and descriptions. In earlier builds, the Poltergust 3000 originally featured a pressure meter ranging from one to ten, and was slightly bigger. If the pressure meter reached ten, the vacuum would backfire and burst out flames, causing Luigi to fall over and lose health, his HP eventually raises back up slightly after a while. Earlier versions of the game allowed Luigi to spray water infinitely. The Poltergust 3000 also had different nozzles depending on what element was being used. Luigi's total remaining health was shown as a fraction. Coins also had their own meter. Early builds reveal that Boos captured would be displayed by a whole number. Originally, the Game Boy Horror had an LCD border, which would function as a red flashing radar to show Luigi the locations of both ghosts and Boos within a room, and had a clock function. One clip shows that once the clock reached 1:30 on the E3 Nintendo Booth version, E. Gadd would contact Luigi and send him back to the title screen. Early gameplay images reveal that instead of showing Luigi his current gold total, the Game Boy Horror would always display a first-person view camera, giving the player two perspectives in a room at once. There were ghosts in earlier versions that were similar in appearance to Gold Ghosts. They would attack Luigi from behind by going "BAAHHHHH! ", causing Luigi to scream, crawl backwards uncontrollably, and lose a large amount of HP, while the denominator of his health guage changes to 50. Luigi's HP raises back up after a while and his heart would beat fast on his health gauge. In earlier versions of the Kitchen, a ghost resembling a chef would have appeared while holding a tomato. The game had a different main menu, giving the options to "Skip Intro" or play "From The Beginning". E. Gadd also had different dialogue. The cutscene showing Luigi walking to and opening the door to the mansion was slightly different. The door was also designed differently. Ghosts had a different sound effect when appearing upon from behind the player, instead of the final scary, loud scream from behind in the final. Ghosts also didn't startle Luigi upon appearing. The Gallery had a different design than the final game. 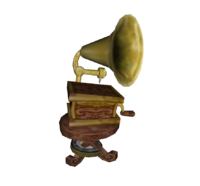 This is the unused phonograph model. It comes with two animations. There are three renders of Luigi left in the code for the ending, each with a varying degree of happiness. The renders are a depressed Luigi holding a flower (worst), a pleased Luigi with a peace sign (good), and another pleased Luigi with two peace signs (best). An unused model for Mario, labeled "bmario", is stretched to Luigi's proportions and given the backstraps for his Poltergust 3000, possibly suggesting that multiplayer was originally planned. Cyan and blue-colored Ghost Guys are also in the game's data. In the game's data is also the unused Poltergust 3000, along with two unused nozzles; one of them is labeled "wpwater". Main Theme - A recreation of an early version of the main theme. Room clear theme - A recreation of an early version of the room clear theme. "Nice doggy!" - A recording, or recreation of an unused "Nice doggy!" sound clip, which is partially used in its remake's trailer. An early Poltergust 3000 on Professor E. Gadd's back. An early version of the mansion, with three different top windows, no visible chimneys, and no gravestones. An early Foyer with a chair to the left leaning on the wall, the final drawer with a lamp on top to the right. There is a spider web, and the Area 2 door design is different (which can still be seen on the select screen), and the mirror is missing. This version of the Foyer can still be seen if the player presses start/pauses the game. Luigi slides down a handrail in the Foyer, running from a light blue ghost. A spider web can be seen on the stair handrail. The Foyer's chandelier falling, with a long narrow hallway carpet. Luigi looks at the viewer, breaking the fourth wall, while in the early Foyer. Luigi being scared by a blue ghost in the Foyer. Likely part of a cut full motion video (FMV). Luigi screaming; this could possibly be for an unused sequence. Likely from a cut FMV. A very early Parlor. Filled with a cafe table, two chairs, a window with curtains, a different china cabinet, an extra side-chair to the left of the table, which don't appear in the final game. There is a cloth on the table with two champagne bottles and a candle on top, a fireplace, and the Area 2 and Area 3 hallway painting of the mansion itself instead of a portrait. The rest of the very early Parlor. There is an analog TV with three blue ghosts on it seen in Space World 2000, similar to the sepia-toned portrait that is seen framed on the Ghost Portrificationizer in the Portrificationizer Chamber in the final game. Two early blue ghosts hide behind an opened door in the early Parlor, likely from a cut FMV. There is a different wall design and a spider web. Unused blue ghosts circling Luigi to the left inside the early Parlor, similar to how Boolossus' minions did. Three blue ghosts appear at the center in the early Parlor playing spider web themed cards for roughly two seconds at one segment. There are three chairs around the table with an ashtray on top, though the middle blue ghost has a top hat and is smoking a pipe, whereas the blue ghost to the right has a haircut similar to Slim Bankshot. The Luigi's Mansion disc, shown at E3 2001, has a different label than the final release. Satoru Iwata holds a Luigi's Mansion disc, which has Luigi with an expression similar to when the blue ghosts circle around him in the early Parlor in the Space World 2000 build. Luigi holding the Game Boy Horror, which was originally just called a Game Boy Color. A depressed Luigi in front of the mansion gates at the end of the E3 2001 trailer. A different main menu, giving the options to "Skip Intro" or play "From The Beginning". There is no "TM" logo, the dirt path leading to the mansion is straight, there are only four gravestones (which can still be seen on the main menu and new file select screen), and the mansion is missing two chimneys. E. Gadd has a different dialogue while talking to Luigi in The Lab saying, "Heh, heh, heh!" More dialogue asking, "What do you want to do, Luigi?" There are only two options to choose from: "Go to the Mansion" and "Practice", labeled as "The Mansion" and "The Training Room" in the final respectively. The option bubble is blue instead of green. Last dialogue saying, "Be careful, Luigi!" Different intro cutscene. E. Gadd's Lab was notably missing. Outside of the mansion gates. Luigi heading towards the mansion. Luigi walking up the mansion's front stairs. Luigi opens the Foyer's front door differently and doesn't say, "Hello." Luigi entering the Foyer, originally called "Entrance". There were two spider webs above the Area 2 door, the mirror had no cloth covering it (which isn't present on the select screen), Toad was missing, and Luigi's HP was shown as a fraction. Luigi squatting for roughly a second in the Foyer, which can't be done in the final game. A boarded up door in the Foyer, which would lead to the Area 3 hallway near the boarded up Sealed Room and Sitting Room. The Game Boy Horror originally had a timer. The Parlor was originally called "Living room". E. Gadd on the floor after failing to catch a Gold Ghost. E. Gadd laying on the floor next to an early version of a Gold Ghost, along with a picture of E. Gadd placed over the screenshot. There is no cloth on the table, an extra sofa, purple Blue Twirler ghost portraits on the wall, and the Anteroom door is different in design and is boarded up. The early Gold Ghost with a light purple color. The portrait has an early Blue Twirler with a black cartoonish top hat and is smoking a pipe, much like one of the blue ghosts seen at Space World 2000. An early screenshot with the Poltergust 3000's pressure meter and further protruding chairs from the table. Luigi receiving a key that leads to the Area 1 hallway with the first three portrait ghosts. Treasure chests were more rectangular-shaped. A treasure chest was originally present in the Wardrobe Room. There is a bat on the ceiling in the Area 1 hallway instead of mice. The hallway has a different wall design. There two mice in the Study. Small Boos inside the Study. Luigi stunning Neville and revealing his 50 HP. There is a cafe table with two champagne bottles on top of it next to Neville's rocking chair. The Study room lit up. A green book on the table is placed closer to the chair. The Game Boy Horror's tech demo time limit reached 1:30 and E. Gadd contacts Luigi and sends him back to the main menu. The Twins' Room door is boarded up. A star themed door for The Twins' Room. The Master Bedroom was originally called "Bed room 1", and featured a wardrobe, two beds with a drawer with a lamp on top between them, and two wall paintings. Two ghosts in the Master Bedroom. There is no drawer with two paintings on top and an extra wall painting. A dark purple-colored Gold Ghost scaring Luigi from behind in the early Master Bedroom layout. Luigi stunning Lydia and revealing her 50 HP. Lydia turns her head back to the player in order for them to stun her. The Master Bedroom lit up. The Nursery was originally called "Child's room". Chauncey is notably missing. An early version of the Nursery room. A stuffed rabbit and two teddy bears are found on a shelf with two paintings in between, and the crib is pulled further away from the wall. Two ghosts and a small Boo in the Nursery room. The chairs were further from the table, which had no vase, a stuffed rabbit on a chair, and two teddy bears on the top of the shelf. The Nursery room lit up. A treasure chest with the key to the Area 2 door. The Laundry Room door is boarded up. Both the Fortune-Teller's Room and basement doors are boarded up. An early dark purple-colored Gold Ghost scares Luigi in the Area 2 hallway near the Dining Room and Ball Room, which were replaced with Bowling Ghost, Ceiling Surprise, and Purple Bomber. An early Gold Ghost scaring Luigi again in the Area 2 hallway. A Gold Ghost scaring Luigi from behind. They do not appear in the Area 2 hallway in the final game. The Poltergust 3000 overheating after reaching 10 on its pressure meter. Luigi heading to an exterior door leading to the Dining Room in the hallway closest to the Area 2 door. Luigi entering into the Dining Room. A door which would lead to the Billiards Room is boarded up. A china cabinet is positioned between both boarded up doors. There were seven chairs around the table and a china cabinet was positioned between the Billiards Room and the Projection Room. A door which would lead to the Projection Room is boarded up. There is a grandfather clock to the right corner of the room. Ghosts in the Dining Room. A possible chef ghost, or red Grabbing Ghost, or early Waiter ghost holding an unused tomato in the Kitchen. A spider web can be seen, there is no fire on the Boneyard door and there's a different array of pots and pans above the stove, with two bottles on top of the sink, and the door which would lead to the Area 2 hallway is boarded up. A red Grabber Ghost in the Kitchen. There are different ghosts in the Kitchen. Luigi sucking up a ghost. Luigi sucking up a ghost from the refrigerator. The early icon for the ice element. Orange colored Purple Punchers weren't in the Boneyard in the final. The yellow sign reading "Skeleton is buried here" was missing and the Graveyard isn't visible. The Boneyard lacks a plant and there's a ground stake to the left of Spooky, indicting Spooky might've been chained up. This can still be seen in the game from the Balcony. The Ball Room door is boarded up. Stacked boxes infront of the Area 3 door near the Rec Room. The Billiards Room is boarded up. Some Area 3 rooms (such as the Washroom (2F), Bathroom (2F), and Nana's Room) were switched and are merged with Area 2. The Washroom was originally called "Lavatory", with a ghost and small Boo inside. There is no painting on the wall and the suckable poster is missing. Luigi in the Bathroom. This image was taken in an earlier build than the E3 version. Small Boos inside the Bathroom. There's just a silhouette of Miss Petunia, whom doesn't appear herself. Luigi using a water nozzle connected to the Poltergust 3000. Nana's Room's door is boarded up. The Area 3 door is missing and replaced with the 2nd floor end. The yarn spinner is in the back left of Nana's Room instead of in the front left. Luigi sucking up Nana, which can be assumed that she had 50 HP like the other two portrait ghosts so far. There's no cloth on the table in the Sitting Room. Bats in the Area 3 hallway, which were white-colored. The Telephone Room had white colored mice. Luigi using the water and fire nozzles in an early Breaker Room. There is a water valve, a table, two chairs, a water bucket, and two oil barrels. Mice in the Area 4 basement hallway. Multiple pink colored Flying Fish in the Pipe Room, in the final they are green colored. Luigi uses his Poltergust 3000 on the Foyer's chandelier. An early version of the Wardrobe Room. Luigi outside on the Balcony in one early build. A different camera angle was used, two trees were missing in the Graveyard, and Toad wasn't present. Luigi capturing Neville in the Study, who likely already had 100 HP instead of 50 HP from earlier builds. Luigi tries to capture a Boo in the Study. The Study doesn't have a Boo of such a HP rather just 50/60 HP. The Conservatory had instruments on the wall, along with steep steps for Luigi to walk on, which are early blue ghost paintings in the final. There is no suckable poster on the wall near the piano. The Game Boy Horror showing what Luigi is seeing in the Courtyard without switching to first-person view. No Flying Fish appear. An early version of the Rec Room. The ladder and mirror in the back were switched up and the windows had metal protectors, along with three plant pots. The tiger mats aren't on tables in the Safari Room in the final version. A later build of the Study. The player has one Boo captured already and is displayed without a fraction rather a whole number, however, this is possible only later in the game in Area 2, and the Game Boy Horror had cartoon-like icons. A treasure chest originally found in the Wardrobe Room. Earliest (broken) version of the Gallery. E. Gadd is at the center, there are dim lights from the King Boo painting section, lack of stones on the ground, no pillars, the statue bases are different, and the brown wall design is similar to that of the Training Room. Second earliest (broken) version of the Gallery with a longer hallway, possibly indicating more portrait ghosts were planned. There are unicorn statues with shorter horns vertically from the Balcony instead of angel statues. Third earliest (broken) version of the Gallery, which is slightly shorter and lacks space for where the Clockwork Soldiers, Biff Atlas, Slim Bankshot, Sir Weston, Bogmire, Uncle Grimmly, Vincent Van Gore and Boolossus portraits would be, likely indicating that the room that houses King Boo's painting might've been larger. The third earliest (broken) version of the Gallery. A test room to the west. An empty room with just a carpet and one half of The Floating Whirlindas, Mr. Whirlinda. A test room version of the Foyer in the south center. There is a different wall design, a mirrored and flatter clock, a ladder, no handrails, one normal room door, a different carpet, the Mario painting from the Secret Alter, Shivers, a candle, fire from the Boneyard door in the Kitchen, King Boo, Toad, and Luigi's right hand during door opening cutscenes. The Game Boy Horror's clock can be restored via Action Relay codes. A test room to the north. There's a carpet, three round tables, and two rectangular tables. A test room to the east. Similar to the Foyer, though there's a different wall design, a carpet, two ladders, a flatter clock, wider stairs, no handrails, and a much smaller King Boo. Luigi using the Poltergust 3000's scrapped water nozzle in the Bathroom via Action Replay codes. What appears to be the portrait of three early or cut blue ghosts, supposedly set to appear in the Parlor, on the Ghost Portrificationizer in the Portrificationizer Chamber. A sepia colored portrait of three blue ghosts playing cards on the Ghost Portificationizer in the Portrificationizer Chamber. An early Game Boy Horror with a timer. A blue vase (labeled "tubo30_1.bin") seen in the E3 demo footage. Some areas that had a blue vase were replaced with a Trapdoor. A blue vase, however, still appears in the Foyer in Luigi's Mansion on Super Smash Bros. Brawl, while final vases are red. The leftover "bad" rank, labeled "luigi_b.bti". The leftover "good" rank, labeled "luigi_g.bti". The leftover "great" rank, labeled "luigi_V.bti". An early Gold Ghost, similar to the white colored version of the Grabber Ghost and had smaller eyes, fangs, a row of teeth, and different shaped heads. An early Purple Puncher, which had an orange color, similar to the Gold Ghost, they had the same eyes too. The variations are different fangs, and a large nose. An early Blue Twirler with a purple color, fangs, teeth, small eyes, and a big nose. An early King Boo, resembling a Big Boo and not wearing a crown. Four unused versions of the Shining Ghost model labeled "Ball", which would've appeared in the Observatory. These were seen in the E3 2001 trailer, though as a white colored variant. The original Poltergust 3000 model (labeled "v_body"), which was bigger and rectangular. An unused Phonograph model (labeled "chiku.bin") that comes with two animations, which would've likely been in the Projection Room. Unused door model, labeled "doorVAC_BODY_ITA4". The Poltergust 3000's scrapped air nozzle, labeled "wpair". The Poltergust 3000's scrapped water nozzle, labeled "wpwater". A mysterious model labeled "elh", which likely would've appeared in the Graveyard. The original Bogmire model (labeled "shadow") who appears in the Graveyard. It features longer wings, narrower flabs of ectoplasm hanging down, a defined chin, and an eerie facial expression. Unused models for blue and cyan color variants of the Ghost Guy, who would've likely appeared in the Ball Room, Astral Hall, and Roof. The Bat Twirler (labeled "bat.bin"), which would likely been similar to that of the The Twins' Room ceiling fan, though was suppose to be in the Nursury. A model labeled "bmario", which shows a T-posed Mario and Luigi both wearing Poltergust 3000 straps, likely suggesting that Mario was once playable in a scrapped multiplayer mode. Mario is notably almost as tall as Luigi. In fact, there's a file called "Koga::MissionMode" in the game. A model labeled "dmario", which shows the same T-posed Mario and Luigi, but Mario is significantly shorter. Artwork of Daisy from Mario Tennis (labeled "Test.bti"), likely a test image for suckable posters on the wall. In fact, the image's file name is located in "game_usa.szp". A model labeled "tomato" that may have been the same one used by the removed chef ghost in the Kitchen, though can function as a Bowling Ghost's bowling ball. In fact, it's found in "game.szp". An icicle that serves an unknown purpose (labeled "turara"), likely to have been used in the Cold Storage. A white flag that serves an unknown purpose. Texture of an earlier Nintendo GameCube model shown at E3 2001, a background graphic placeholder loaded with the scenes for bosses, such as Chauncey and Bogmire. An animated Game Boy Horror timer in the game's files. A cafe table (labeled "otuku.bin") would've been in the Mirror Room. A pink colored Mouse (labeled "rat_3"), which is another unused color variant of mice, aside from the Blue Mouse, Purple Mouse, and Gold Mouse. A loveseat sofa (labeled "isu12_1.bin") was suppose to be in the Billiards Room. A ground stake (labeled "a_kui_1.bin"), likely suggesting that Spooky was going to be chained up. This can still be seen in the Boneyard from the Balcony in the final game. A ladder (labeled "hasi34_1.bin") would've been in the Study and likely in other rooms with bookshelves as well. A Matryoshka doll (labeled "gidemap.szp"), likely an early Luigi's head that appears on the Game Boy Horror's maps. An unused graphic labeled "Obake01", likely the same early blue ghost with a slightly different design from the Nintendo Space World 2000 trailer. An unused graphic labeled "Obake02". An early map of the third floor labeled "gidemap.bin", which had an extra room on the left side of the Balcony on the third floor. Gold Ghost icon, likely indicating that Gold Ghost's dialogue would've been shown in a dialogue box when stunned and sucked up. Green Toad icon, likely suggesting that there were going to be color variations of Toad. The Mario icon is missing from Mario's dialogue, while Luigi is at the Bottom of the Well and Mario is trapped inside the Secret Altar. The Mario icon appears in the later versions of the Nintendo 3DS remake. The "Underground lab" (The Lab) text string (labeled "e_labo.bti"), likely indicating that The Lab was once explorable. The "Training Room" text string (labeled "e_kunren.bti"), which doesn't appear in the final game upon entering. The "Ghost Portrificationizer Room" (Portrificationizer Chamber) text string (labeled "e_labo.bti"), likely indicating that the Portrificationizer Chamber was once explorable. The "Gallery" text string (labeled "e_galler.bti"), which doesn't appear in the final game upon entering. A promotional poster for Nintendo Space World 2000 featuring five Nintendo GameCube games, one of which is an early version of Luigi's Mansion. There three unused ghosts, one of which is an unused blue ghost from the Space World 2000 trailer. A Nintendo Power magazine, the October 2001 issue #149 of Luigi's Mansion. A Nintendo Power magazine of Luigi's Mansion Pg. 36. A Nintendo Power magazine of Luigi's Mansion Pg. 37. A Nintendo Power magazine of Luigi's Mansion Pg. 38. A Nintendo Power magazine of Luigi's Mansion Pg. 39, mentioning a hunter ghost set to appear in the Safari Room, which is unlikely as the game was already released the previous month in Japan, likely hyperbole. The Japanese version of the game kept Luigi's early or cut hurt sound, while U.S. and European versions didn't. The Game Boy Horror's timer and first person view is still in the game's code for all regions and has been found and made into Action Replay codes. ↑ 1.0 1.1 Calderon, Anthony (January 21, 2005). The Making of the Game - Luigi's Mansion. N-Sider. Retrieved November 29, 2014. ↑ Edge Staff (July 7, 2010). Hideki Konno Discusses The 3DS. EDGE. Retrieved November 29, 2014. ↑ 3.00 3.01 3.02 3.03 3.04 3.05 3.06 3.07 3.08 3.09 3.10 Luigi's Mansion E3 2001 Tech Demo Show Off. YouTube. Retrieved November 29, 2014. ↑ Nintendo Gamecube, SpaceWorld 2000. YouTube. Retrieved November 29, 2014. ↑ Space World 2000 GameCube Movie Reel. YouTube. Retrieved November 29, 2014. ↑ 6.0 6.1 6.2 Luigi's Mansion E3 2001 Trailer - IGN. YouTube. Retrieved September 1, 2018. ↑ 7.0 7.1 Luigi's Mansion/Unused Models. The Cutting Room Floor. Retrieved November 29, 2014. ↑ Luigi's Mansion E3 2001 - Nintendo Booth. YouTube. Retrieved November 29, 2014. ↑ Prelease screenshot of the mansion's kitchen. ↑ 10.0 10.1 10.2 10.3 Luigi's Mansion/Unused Graphics. The Cutting Room Floor. Retrieved November 29, 2014. ↑ Luigi's Mansion Official Nintendo Instructional Booklet, page 17. ↑ 14.0 14.1 14.2 Luke Dzamonja. (May 17, 2015). Unused LM BETA & Unused Content (With some hacks)., YouTube. Retrieved May 24, 2015. This page was last edited on February 10, 2019, at 12:08.